This entry was posted in Abortion, Miscellaneous Category That WP Won't Allow Me To Delete, Damnit. and tagged abortion, anti-choice, Gay Pro Life Network, lgbt, Opposition to the legalization of abortion, prochoice. Bookmark the permalink. I think you’re fair on the whole, but as you asked, I’d defend his/their retweet of CatholicMouse. It’s a retweet, not something he’s written himself. Andrew says: “We think human rights begin when life begins”. This is so muddled and not in any way congruent with the scientific biological facts and how we treat other forms of “life”. It needs to be explained what is meant. 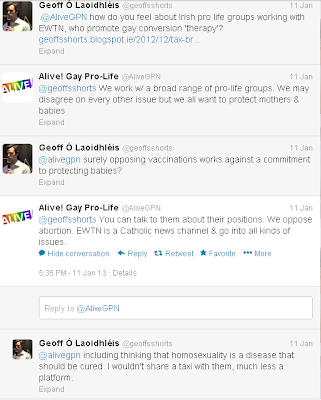 Note that pro-lifers generally mean human DNA when they are talking about life. What does Andrew mean? How does Andrew define life? A cabbage is composed of living cells; what’s so special about 100 cells of human DNA and a living, fully formed “beyond-just-begun” cow, likely to be slaughtered and consumed by humans? Do human rights begin when a sperm impregnates a human cell? Or does it need a certain number of cells? From where does Andrew build the foundation for the position that “human rights begin when life begins” and just what is life and just when does it begin in his mind?